Have you ever tried to make a slideshow for Facebook with music in the professional authoring software only to discover that you need to invest days to learn all its tools and options? Remember how you made your first slideshow but decided not to show it to anyone because of the amateurish look? Well, if a slideshow is still what you want to do, you may want to read this brief explanation how to make a slideshow for Facebook with music. But we suggest that after reading this, you should download the software and try to make it yourself. Photo Slideshow Creator has been designed with the ordinary user in mind which is reflected in the wizard-style interface, a large library of slideshow templates coming in a variety of styles and many beautiful transition effects. So anyone regardless of the creative ability can make a slideshow for Facebook with music literally in minutes without getting bogged down in countless windows, menus, buttons and settings. To begin, you have to install and run Photo Slideshow Creator. This opens the main window with the file browser, timeline and built-in player. Browse to the folder with images, click and drop photos down to the timeline. As you do so, the program inserts the transitions between the slides automatically. When you are finished, you click on the Play button of the player to preview the slideshow and make changes if you don’t like the effects inserted by the program. For this purpose, go to the Transitions tab, pick the effect you like and drop it between the slides. Similar to books that have hard cover and are divided into parts, Photo Slideshow Creator lets you add pre-built slides in the start and end of the slideshow, as well as between the slides. In the program, these slides are called templates and have a predefined design: background, images and text captions. You can edit any template to your preferences such as change background fill, edit text captions, drop shadow and outline. 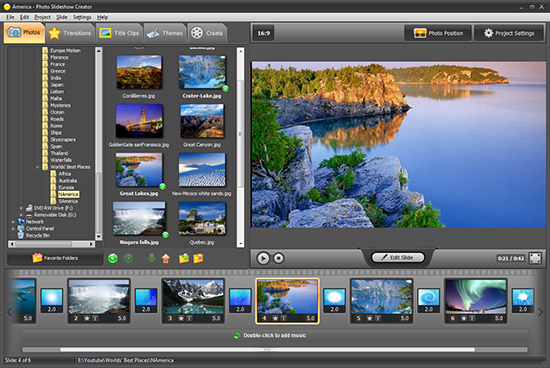 HD slideshow software also has a library of skins that let you give a professional look to the slideshow. For example, if you want to create a slideshow with your wedding pictures, you can select the Greeting Cards category and embed the slideshow into the heart-shaped frame with cupids and flowers around. Or, if you’re creating a movie with the photos from your recent vacation, you can choose the Travel category and apply a beautiful theme with the sun, palm tree, sea stars and ocean waves that will make your photos look twice as attractive. Next is to add music to the slideshow. On the menu bar, select PROJECT > MUSIC OPTIONS. This opens the dialog that lets you add one or more music tracks and sync music with the show, so that a music track is played as long as a slide is displayed on screen. Additionally, it’s possible to apply faders and enable Shuffle or Replay music. The final step is to save the output. On the CREATE Tab, select CREATE VIDEO SLIDESHOW > CREATE VIDEO FOR INTERNET > VIDEO FOR FACEBOOK. What happens next is that the program processes your creation and saves to the selected output format which is perfect for posting to the Facebook wall. That’s how to make a slideshow for Facebook with music.